Instant Watcher for VoIP is an advanced tool that lets you easily record, play, store and add emotion sounds to voice communications held over the Internet. 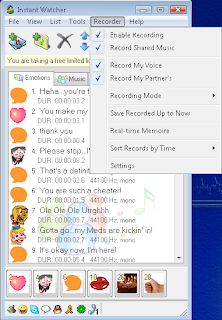 It is an application that works in conjunction with Skype, Google Talk, Yahoo! Messenger, Windows Live Messenger and ICQ without diminishing these applications functionalities. Instant Watcher is able to record conversations automatically in real time. It can monitor all conversations on your Local Area Network in stealth mode.